THEA partners with the community organizations on everything from beautification to economic development to education. Through these projects we are committed to the progress and future of our region. This fund supports engineering students on the University of South Florida Tampa campus who are graduates of Tampa Bay area high schools. These scholarships are based on merit and financial need. The scholarship seeks to increase the educational opportunities and exposure to transportation careers for Tampa Bay area students. An annual event, the design competition is hosted by USF's College of Engineering and sponsored by THEA at USF's Engineering Expo. 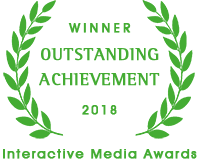 The competition is open to all High School and Middle School students in the Tampa Bay area. The competition consists of teams of three middle or high school students who have designed and built model bridges from balsa wood. The competition then tests the load capacities of the bridges. The bridges are put under simulated load tests until the balsa wood cracks beneath the weight. Bridges are judged on craftsmanship, originality, design drawing and most importantly, load capacity. Winning teams receive a traveling trophy for the school and individual trophies for each team member. Get involved with the competition and learn more on the Bridge Building Competition's website. When Hillsborough County Deputy John Robert Kotfila, Jr. lost his life to a wrong-way driver on the Lee Roy Selmon Expressway in March of 2016 we wanted to do something to honor his legacy. After we had learned about the strong bond between Deputy Kotfila's and his German Shepard, Dexter, we decided to dedicate the Selmon Greenway dog park in his honor. Tampa Hillsborough Expressway Authority is excited to announce that the dog park is THEA’s first Selmon Greenway Pocket Park and it is located at 705 Raymond Street, underneath the Selmon Expressway behind the Bell Channelside Apartments. The Deputy Kotfila Memorial Dog Park has plenty of room for dogs of all sizes to socialize, with separate play areas for small and large dogs. 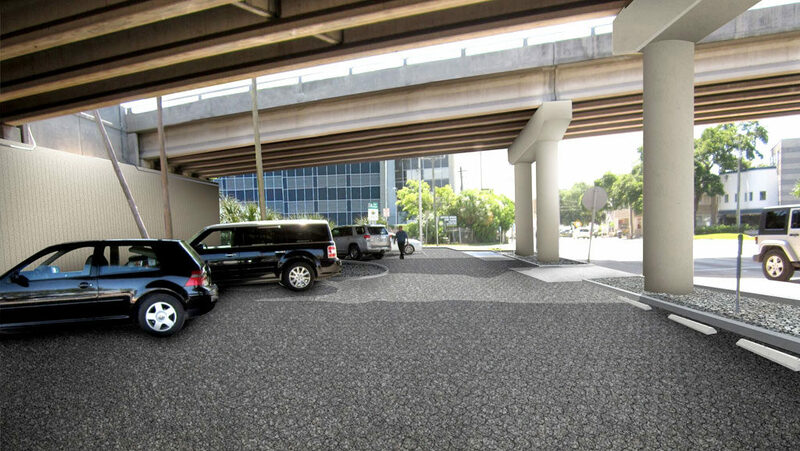 We installed top of the line canine turf, which is safer for puppy paws, more durable and requires less maintenance – all under the shade of the Selmon Expressway. K9Grass, an innovative artificial grass especially designed for pets. Unlike other generic artificial grass, K9Grass is softer and won’t cut or damage the paws of smaller dog breeds. Other innovative elements include water fountains with built-in pet bowls and large bench-style seating throughout the park. We hope you and your furry friends will enjoy this latest amenity along the Selmon Greenway. 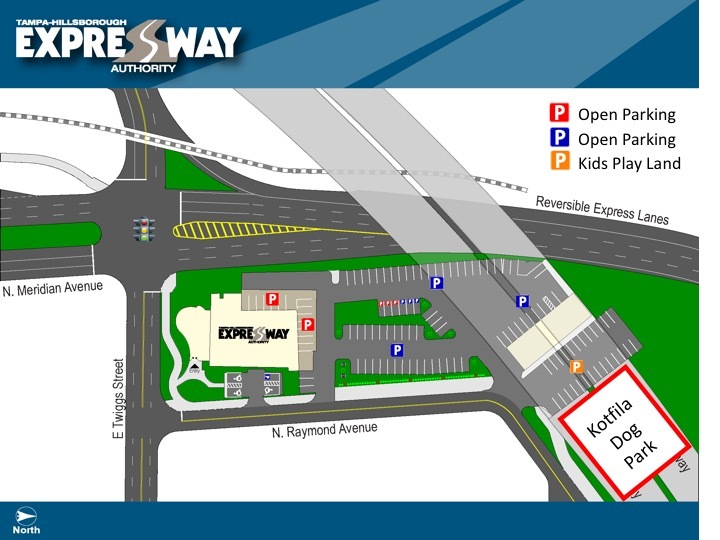 Click here for the parking and location map. 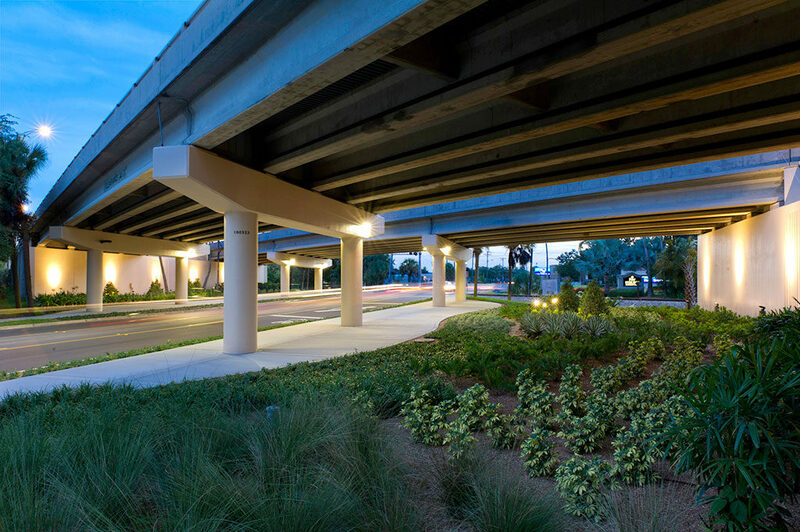 THEA partnered with the Historic Hyde Park Neighborhood Association to create a pedestrian-friendly space under the Selmon Expressway Swann Avenue overpass. We added landscaping, irrigation, up-lighting, electrical and an improved and enlarged sidewalk for pedestrians and bikes. 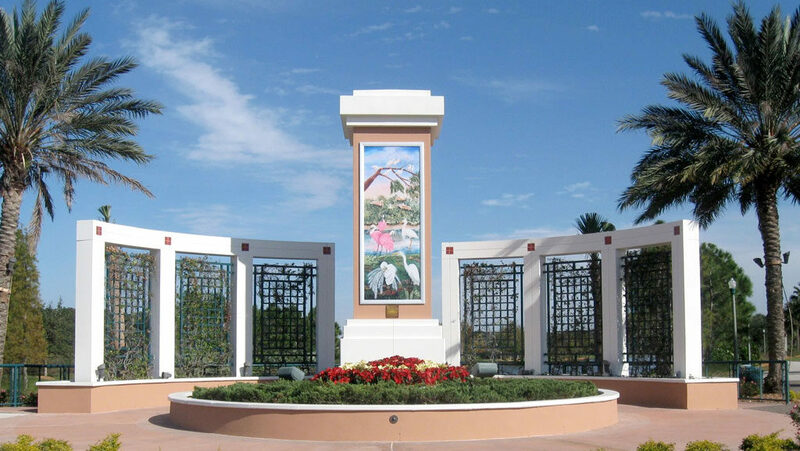 THEA partnered with the Palma Ceia Homeowners Association to improve the parking lot under the Selmon Expressway Bay to Bay overpass on the north side of Bay to Bay Boulevard. 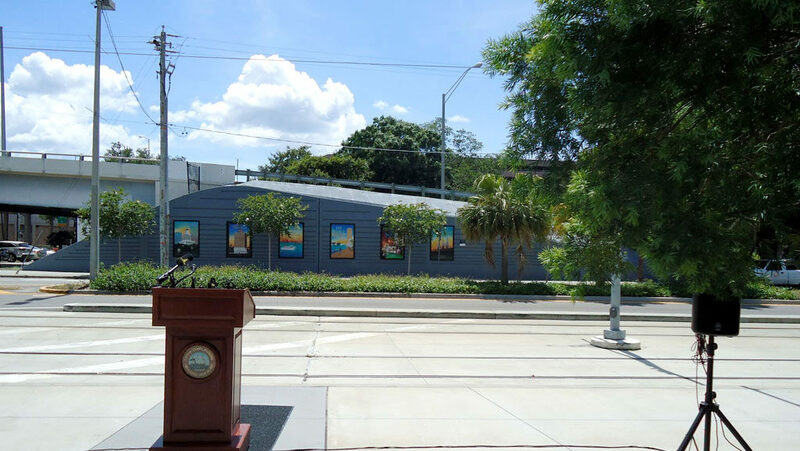 THEA partnered with the City of Tampa and Tampa’s Downtown Partnership to create an outdoor space that features art from Tampa Bay area artists on Franklin Avenue. THEA partnered with the Brandon Fine Arts Council and the Brandon Chamber of Commerce to create the painting of Brandon Tower, which is located at Brandon Boulevard and Town Center Drive. 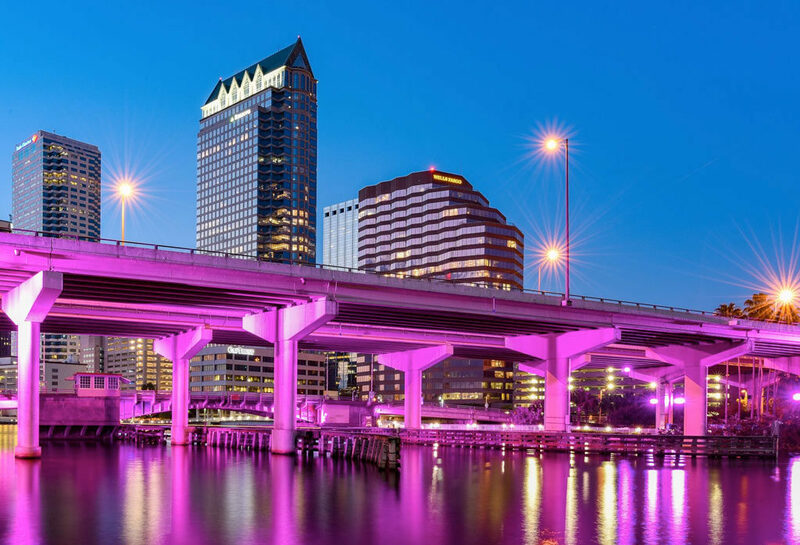 THEA partnered with the City of Tampa to light the Selmon Expressway bridge over the Hillsborough River in downtown.